One’s out, here’s the other. We’re of course referring to the just-unveiled Toyota Rush and its sister car you see here – the Daihatsu Terios. The twins replace a duo that has been around for over a decade. They will take on SUV-flavoured MPVs such as the Honda BR-V and Mitsubishi Xpander. As with many Toyota models in Indonesia, there’s a Daihatsu twin offering the same car with slightly altered styling and a lower price tag. What many don’t realise is that Daihatsu – now wholly-owned by Toyota – takes the lead in many of these projects and manufactures the cars for both brands. That’s the case with the new Rush-Terios, although only the Toyota-badged car will be exported to other emerging markets. The new Terios is underpinned by an overhauled platform, which means that it retains the front engine, rear-wheel drive layout. Handling stability and ride comfort, NVH levels and fuel efficiency have all been improved, Daihatsu says. Like the Rush, the Terios gets a new engine – the 2NR-VE 1.5 litre Dual VVT-i unit makes 104 PS at 6,000 rpm and 136 Nm of torque at 4,200 rpm. It’s around 25% more efficient than the previous mill. Gearbox options are a five-speed manual and four-speed automatic. The 2NR has been in the Toyota Avanza/Daihatsu Xenia since 2015, and is the same engine we get in the new Perodua Myvi. Like the Rush, the seven-seater Terios is 4,435 mm long and 1,695 mm wide, which is 18 mm shorter and 40 mm narrower than the Honda, although its 2,685 mm wheelbase is 23 mm longer than the BR-V’s. Ground clearance is a high 220 mm, which is a valuable feature in Indonesia (BR-V 201 mm). Daihatsu says that cabin length is up by 170 mm, which increases tandem distance by 45 mm (distance between first and second rows) and and cargo area length by 150 mm. The expanded luggage space is large enough for four of the gallon bottles that are widely used in Indonesia. The new Rush-Terios ditches the boxy faux 4×4 look of old (no more spare wheel on the tailgate too) for a MPV-SUV style with hints of the Toyota Fortuner in the design. While the Rush uses dark chrome for the front grille for a sportier face, the Terios comes with chrome horizontal slats, matched with chrome foglamp housings. Like the Rush, the headlamps are LED units. It’s the same at the back, but with the addition of black trim bridging the long wraparound tail lamps. Such a big improvement in design and features. Would you like to see this Terios in Malaysia as a new Perodua Kembara? Or would you prefer a more compact, but more sophisticated car-based SUV from Perodua (think HR-V instead of BR-V)? The latter would be nice. Perodua said earlier this year that it is “seriously considering” a compact SUV, so keep your fingers crossed. Perodua should rebadge this car. Then next year, for sure Perodua sell 300,000 cars as opposed to 200,000 this year. This will be the ULTIMATE car. Everybody will buy this. After all, it is Daihatsu/Toyota technology. Time tested and proven. Quality and reliability ada. I will be too scared to buy any China car. Proton is wasting precious time launching the Boyue. Waiting till year end of 2018. Meanwhile, so many candidates like this car, the Rush and many others are appearing. Time is of essence. Time is vital. If u dun do this right, time that will concern is endtime very soon. Has they done actual road test for new Mivi? Mitsu lancer cannot save them. What jack a chinese brand can do to save them? And dont bring in Volvo into discussion, it ranked one of the worst quality in latest survey. Perodua shouldn’t bring this car into Malaysia. Body on frame cars is a step back. I know flooding become more of an issue in this country, but I think Perodua should leave this vehicle to Toyota. That being said, I wonder where this car going to slot in. Toyota already has so many MPV/SUV. Avanza, Rush, Sienta, C-HR and Innova. So maybe Toyota carriers the C-HR and Perodua carries this. I disagree. P2 needs a replacement for the Alza, not a new additional compact SUV model that seats only 5 people and takes up valuable factory, showroom and storeyard space. If I were UMWT and P2 going up against Honda Malaysia, I would let P2 rebadge this new Rush/Terios as the new Alza to battle the ugly Honda BR-V which is in exactly the same class of vehicle, while UMWT Toyota would introduce the C-HR to fight the yet-to-be facelifted Honda HR-V which again, is in the same class of car. Proton Ertiga oredy cornered that segment. sad but true P2. An Ertiga owner is basically saying he/she is 100% unattractive and has basically given up on life. U mean Ertiga left in the CORNER !!? Don’t think this is body on frame car. innova and fortunner are. Perodua has rebadged the Terios previously – it was called Nautica here. Unfortunately, the price was wrong – above RM 90K because it was a CBU. For Perodua to make a success of this model, it has to be produced locally. They need to be pretty sure of the potential sales volumes before they do that. 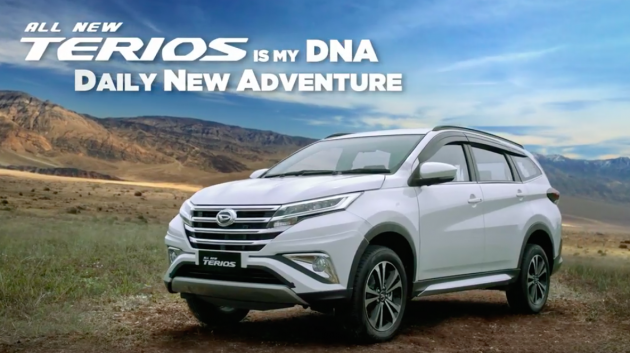 first rebadged Terios was selling very well in Malaysia. it was known as Kembara. Don’t forget it is 4WD. 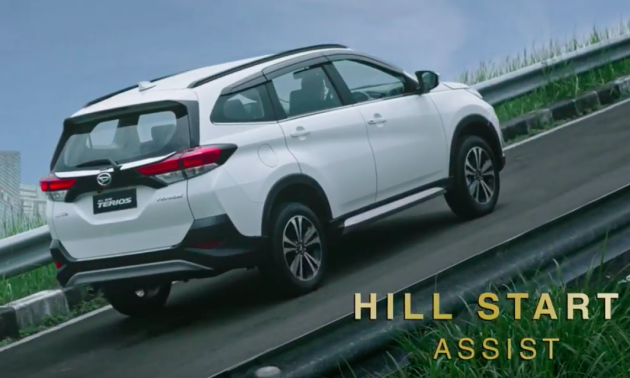 Compared to kembara and Toyota Rush in Malaysia it does not comes with 4WD. This is like asking whether you like Daikin aircon or Akira aircon. Which one would you fix for your house? which one is Daikin aircon ? Daikin sux. When compressor kongs, need to replace whole aircon unit. Better get Akira, at least its cheap to replace. using 1.5dual vvti engine? same as in myvi? seriously? then, there is no problem for perodua bring this new kembara / nautica on road! Price is main factor (price it as old kembara price range, sure ok. Maybe perodua can offer 5 seater or 7 seater opition. Some small family doesn’t need 7 seater, since they got more than 1 cars. They may just want a suv looks car….. But the BR-V is a mini-SUV.. it’s the Mobilio that’s a mini-MPV. Daihatsu Terios ==> Perodua Alza ?? Just to point out the Kembara was a proper 4WD. I would say that this can be a replacement model for the Kembara. For the ARM (Alza Replacement Model), wait next year, because the All New Avanza/Xenia will be out next year. Yup, offer 5 or 7 seater options… price and safety spec is main factor…. pls dont price it like last nautica big failure for Perodua!!! Would you celebrate the unlikely event that P2 gets to rebadge the C-HR and call it the new Kembara? Like you, I am very eager to see the return of the legendary Kembara nameplate. I like, i like…. bring it to Malaysia although, its slightly smaller than BRV which i think its ugly. 4 gears also a bit out but i don’t care since the engine is reliable….. PROVEN…. Mivi owners too claim to be 1st in world to have teh tarik hook, but then everyone else is laffing at then instead. Not as many as those laughing at having half the syarikat gagal being sold to new tongsan masters. Go help them clear the slow moving stock lah, come back here when your master sells enough to break-even. I alredi struggling to clear old P2 stocks, nobody wants to buy. So why need to help P1 as well? All comments come from B40 & M40 people. Sad that we are approaching 2018, and people exited about 104hp 4 speedo. Comedy LoL. When you drive P2 & P1, you are poor. Fact. I’m one of the M40 people. If a new Merc was sold for under RM100k we would be just as excited as you rich people. Now go off and spend your daddy’s money. You are Right. GDP for US is US18.57 Trillion. Malaysia GDP US296.36 billion. Err. Nobody got excited. Deswai I din bother coomenting on new Mivi. The only ones got high is their SAs using multiple nicks to create a perception of excitement, but truth is, nobody bothered. I wanna engine more than 1.5cc to suit the bigger body..i don’t mine to pay more for bigger cc/Hp/torq..
Like the looks very much…but what? !…Terios / Rush no more an AWD? !…although may not need it in real life but so sad, feel like missing the DNA. If badged with P2 logo, cheap price. If badged with Toy logo, expensive price. I agree. 1.5cc is smaller than some RC engine. U need a lil bit bigger to push. Is the engine is mounted longitudinally? Since it is RWD? Can d platform accomodate an AWD arrangement? Komen acah2 bagus..Nak beli tak nak sudah..Buat penilaian sesuai dengan kelas SUV bukan Myvi..